We have begun a new initiative to upgrade and enhanced the design capabilities of the site builder system. From the ground up, we are looking to provide the most modern and current design trends in a flexible easy to use environment. We have been hard at work in the design area and have many exciting new updates currently in development. You should start seeing many of these updates in the coming months. With these updates, we hope to highlight all of the flexibility of the service and make it much easier for customers to get a customized/professional look for their website. We are reviewing all the latest design trends and working to incorporate them into our design offerings. Our designers are working on a large set of new designs and upgrading the design selection process to showcase the very best we have to offer. These new designs will include updated layouts and images. We are also working on several design presentation concepts to help customers see all of the available options. We are currently refreshing all of our current designs and layouts. These updates will include menu updates, spacing adjustments as well as adding textures and new layout options. 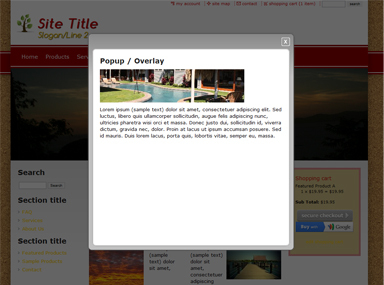 We are creating new larger preview images for all layouts. Fonts are an important part of giving a website a unique and customized feel. We are adding many more fonts into the system. These fonts can be used for default text styles or the logo builder. We are investigating many options for making the design customization process easier for customers. This will include better default designs and an upgraded trial site with sample text/image layouts. We will be offering coordinated style sets of text, links, titles, groupboxes. Instead of having to go through all the design settings and tweak each of the style option, customers can view available style sets, find one that they like, and apply it to their entire site. Many new color schemes are being added to the system. Customers will not have to pick each individual color in their color scheme. They will be able to choose from many pre defined color schemes that are optimized for work with the site builder. Updates to the logo builder will make it much easier for customers to create a great looking logo. In addition to new logo styles, the updated logo builder will give customers to option to choose from pre configured logo styles (font, sizes, effects). Customers will be able to view pre-configured logo text styles and pick the one they like. The option to adjust all the settings will still be available. Providing pre-configured styles will make it much easier for customers to get a customized logo style without having to make a lot of settings adjustments. The layout builder providers a very powerful set of tools for customizing just about every aspect of the site layout. This includes making adjustments to spacing, borders, background textures and more. New updates to the layout builder will make it even easier for any customer to construct an unique layout to meet their needs. One of the challenges with the current design system is that all design changes are live. Many times customers want to try out different design ideas. With the addition of design preview mode, customers will be able to try different designs, make adjustments and then apply them to their site when they are ready. With every one of the templates that we offer, the designs can be setup to look really good or not so great depending on how the pages are formatted. If you take a template, add your logo, setup a banner and create good looking text/image layouts for your pages, you can setup a great website. Many of the sites that do not look professional suffer from badly formatted pages. To help lead customers in the right direction, we will be setting up reference page layouts. These layouts will help customers see what looks good, give them ideas for their own page layouts and provide them with a great starting point for new pages. Instead of adding each component to the page individually, moving them around and changing options, customers can preview the reference layouts live to see how they look on their site. They can then create a page from a reference layout and then add their own text/images for a clean, well formatted page. Get the most of your Facebook presence with the updated Social Media Component. Facebook and twitter social media components are a great way to let your website visitors share the content on your site with their friends. We offer a Facebook Social component free with any of our website builder Packages. The updated application now includes the latest Facebook social component: Like button, as well as an overhaul of the interface, which makes setting up social sharing easier than ever.